CK Power is a proud provider of Kohler Generators, the finest line of standby power systems on the market. These time-tested backup solutions have been ensuring the power stays on in hospitals, universities, banks, data centers, cell sites, watercraft, homes and more since 1920. In situations where our customers simply can’t afford to place total faith in the grid, they trust standby power generators from Kohler Generators and CK Power. 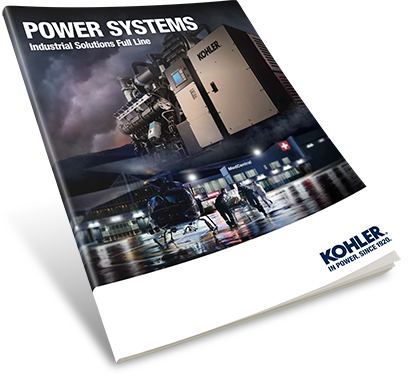 Our Kohler Power Systems are capable of protecting the critical power applications of nearly any industry with products ranging from 5KW to 4000KW. And we have the qualified staff on hand to advise and to help our customers create the right standby power solution for their application. And after the installation, your contact at CK Power will help you to devise a preventative maintenance schedule in compliance with your industry’s regulations. In addition to commercial and industrial standby generators, CK Power also carries a full line of Kohler natural gas and propane standby power systems for residential use. Residents who experience frequent outages, or have business or medical concerns that make outages unacceptable, can find a solution in CK Power. Kohler standby generators work by automatically kicking on once it is detected that the power supply has dropped below acceptable levels. The generator then runs until it detects that power has been restored, ensuring there’s no downtime between when the power gives out and the standby generator kicks on. When losing power simply isn’t an option, Kohler Generators are there to keep the lights on. For assistance with choosing the right standby power generation solution for your commercial, industrial or residential application, get in touch with CK Power today.